6.The headband incorporates memory elastic stainless steel strips inside, you can remould the headband shape to fit you better,or adjust the wearing angle to make the headphones fit snug on your ears. 7.Automatic shut off function prevents batteries from draining when left on. Pls switch it off first and then switch to A/B when next time to use. FREE BATTERY COVERS AVAILABLE: add as replacements in case of the original ones being lost. Please search the "special offers and product promotions" at the below of this page to get them (log in through PC). Foldable Universal Car Kids headphones: compatible with most car DVD systems. (universal IR frequencies: CH A: L/2.3MHz,R/2.8MHz; CH B: L/3.2MHz,R/3.8MHz). If your DVDs' IR frequencies are non-universal, you will need to buy the original headphones. 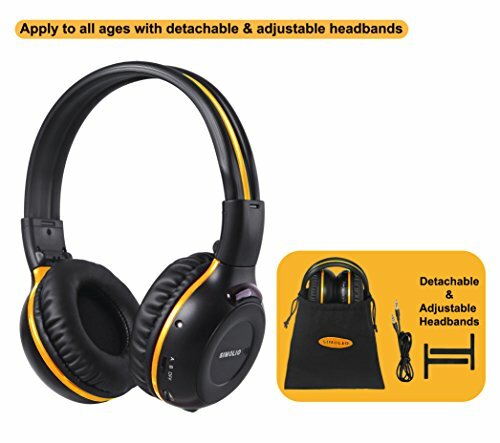 Wireless IR Headset: it is not only a perfect traveling companion for a family car trip, but also can be used with IR transmitter (not included) to enjoy late night TV shows without disturbing your family or kids can leave you a peaceful space by using it to watch their favorite cartoons or play games. If your car DVD has not a built-in infrared transmitter or you want to use these IR headphones for TV watching at home, we suggest to buy our Simolio IR Transmitter for better performance.